Winter is fast approaching here in Richmond, which means cold and wet weather. Both of these things can be bad for your wood fence. This week, we’ll talk about how to prepare your wood fence for the winter ahead in order to keep it in good shape throughout these cold and wet months. We’ll also talk about how a good fence installation company in Richmond knows how to install your wood fence with the winter in mind. First, you’ll want to inspect your wood fence. Look for any damaged boards or posts and fix them now. The damage will only get worse in the winter. You’ll want to trim back trees and other vegetation around the fence. This serves two purposes. First, bushes and other vegetation near fences hold moisture from rain and snow. Wood doesn’t like moisture (which is why you should stain your wood fence too!). Second, branches and limbs above your fence can become heavy with snow, and break off, falling on the fence and breaking it. Trim back trees and vegetation around your wood fence as your first step for winter fence care. If it’s been awhile since the last time you stained your fence, now is a great time to restain it. Staining protects the wood from moisture, which makes it last a lot longer. You can learn more about staining a wood fence in our blog. During the winter, you should keep piles of leaves from building up along the fence’s base, as these tend to hold moisture there. Make sure the cement footings where the posts are are kept clean as well. Keep moisture away from the cement reduces the chances that it will get into a crack and freeze, causing damage. The right fence installation company in Richmond knows how to install a wood fence to reduce the likelihood of problems in the winter. Posts must be set deep enough to prevent shifting soil (common in the winter due to freezing and thawing) from moving them and damaging the fence. The right kind of wood needs to be used in order to maximize the fence’s resistance to moisture. And of course, the fence needs to be stained during installation. 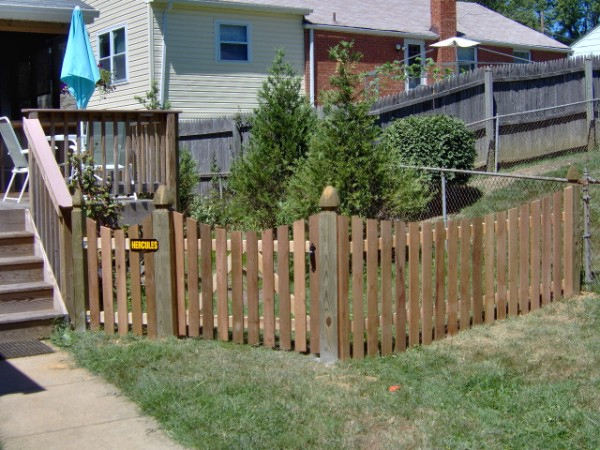 To learn more about wood fence installation in Richmond, contact Hercules Fence of Richmond. This entry was posted on Wednesday, November 26th, 2014 at 5:05 pm. Both comments and pings are currently closed.